Update your Tennessee All-On-One™ or Mobile Poster Pak™ with this 2017 Unemployment Insurance Peel ‘N Post™ sticker. The 2017 Tennessee Unemployment Insurance Peel ‘N Post™ adheres to existing Tennessee All-On-One™ Labor Law Posters and Mobile Poster Paks™ to ensure required workplace posters are compliant. 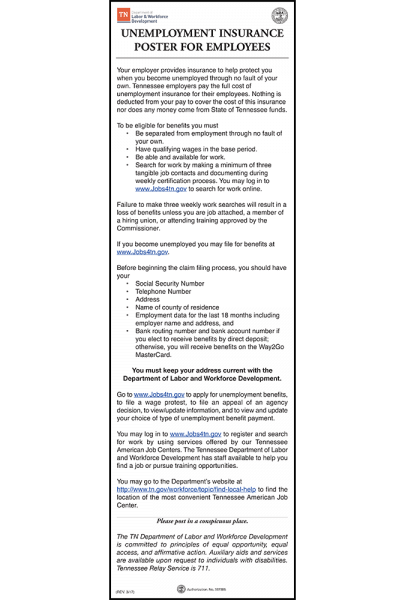 The Tennessee Unemployment Insurance Poster for Employees provides information on the requirements a separated employee must meet in order to be eligible for benefits, and what data is required to begin the claim filing process. The posting was updated in March of 2017 to reflect changes to eligibility and filing requirements, as well as how benefits may be received. Benefit recipients can no longer file by telephone or on the Tennessee Department of Labor and Workforce Development website; instead they must register and file for benefits on Tennessee’s job search website, Jobs4TN.gov. Recipients will now receive benefits by automatic debit on the Way2Go MasterCard. Employers who are liable to pay unemployment taxes are required to post the Tennessee Unemployment Insurance Poster for Employees. It should be posted with other required Tennessee labor law notices, in a prominent place where employees have access such as a break room or time-clock area.